After the last post I’ve watched a few more episodes and have arrived in Season 3 of the wire. 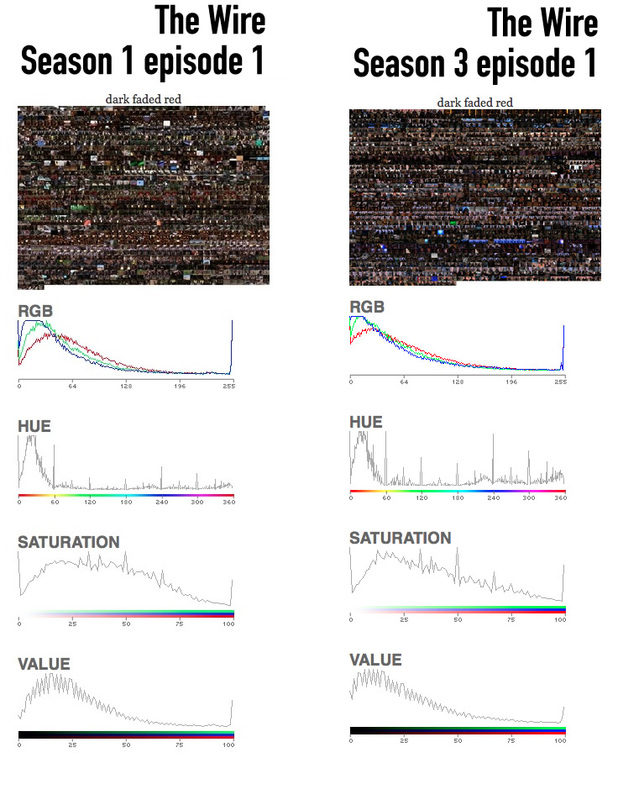 I though it might be interesting to see the overall colours of different episodes or seasons and compare them. Both described as dark faded red. I wonder if it would be interesting to expand this to other episodes and series or if everything looks dark. A while back I posted about gifboard and it’s bigger brother storyboard. 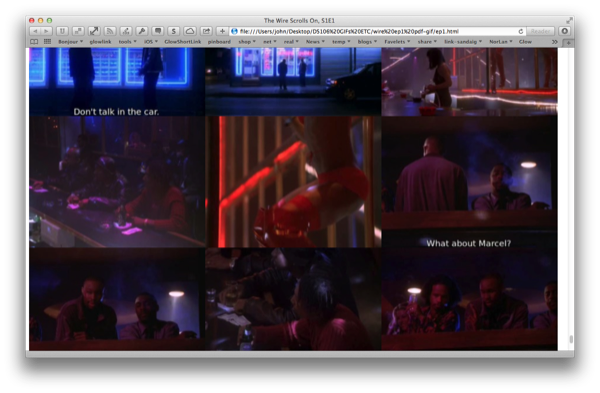 I’ve played a bit with storyboard and the wire this week. Storyboard is a command line application which creates pdfs from movies with subtitles, one page per subtitle. I just started with a bit of playing round with no particular destination in mind. The first thing I did was rip a pdf of subtitled frames from Episode 1 using storyboard. This gave me a 30mb file with >1400 ‘pages’. Which resizes them nicely. 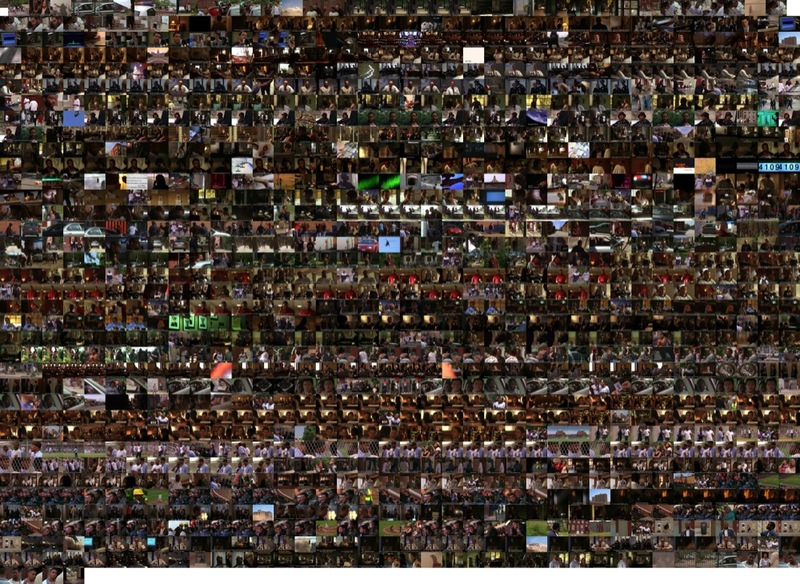 I also duplicated the folder and made a set of smaller jpgs and some gifs with sips too. My first thought was to make some animated gifs2, but a gif with 1497 frames turns out to be pretty big, even if you reduce it to 8bit. There are probably a few interesting gifs in this project which I might return to. My next idea was to make one of those infinite scrolling web page with the jpg, and this turned out ok: The Wire Scrolls On, S1E1. This gives quite an interesting view of the episode, it is pretty dark and there are a lot of closeups and expressive faces (this might be skewed by the fact we grab bits of dialog). I was quite surprised that the page loaded quite well. I can’t imagine how long it would take to do something like this with a gui application. I can imagine that quite a few folk would not be all that interested in this process or the results, am thinking that it is somewhat analogous to looking at large sets of data. These image manipulating commandline tools allow different views of video to be created quickly. They also give an overview of a whole section that can be analysed and mused over. I am not really much of a command line user although I’ve dabbled over the years and installed a fair number of applications along the way. I would recommend that dipping toes in, with say gifsicle before jumping in to install and try a pile of stuff. Google is your friend here and you can often find a command line way to do something by adding ‘command line’ to the search. In addition to the tools above, or even before, ffmpeg for example. Update: The Wire EP 1 Mashup. 1. I little digging around reminded me I had installed this as part of poppler. Poppler I’d installed using homebrew (the chain is tangling already). If you want to install various command line apps I’d recommend homebrew as a good option. 2. gifsicle is a wonderful command line application for creating animated gifs. My last couple of posts have been about using and setting up videogrep.py. I’ve been thinking about how to use it, especially since Jim Groom gave it a rousing reception( Wiring Supercuts & The Game Supercut ). I’ve always liked the suspect board on the wire, where the detectives pin up pictures of suspects in a mindmap fashion, and wondered if I could make a board with Supercut videos of the characters. Turns out I can: Wire Characters Season 1. Gets clips with either Kima or Greggs in the subtitles. I then convert the mp4 files with miro video converter, using iphone as the setting, this lets me hear the clips which lose sound on my system. I open the output movies with QuickTime Pro find a still and hit copy. Switch to Fireworks and paste into a new document, save as a jpge with the same name as the video apart from the file extension. 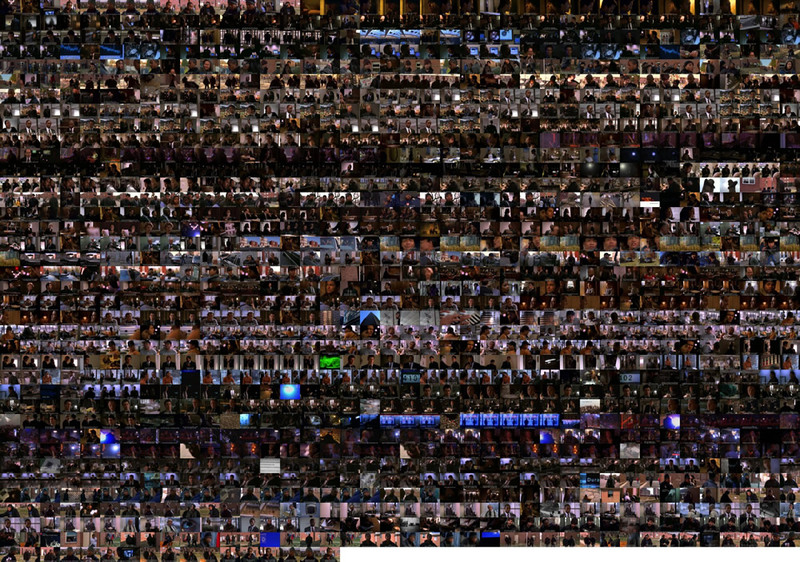 I’ve now got a folder full of movies and images and just need a html file to display them. I also missed a few things out. The files are big, converting them with miro made them bigger, I guess I could use ffmpeg to do a better job of that, I could also scale them down to the size they are displayed. The videos do not play in Firefox on a mac, firefox does not support the video format in the video tag. I had a very quick try using mediaelement.js to add flash for firefox but it looked like it would be too much work to display properly. I could also convert all the files to ogg for firefox, I might try that in combonation with scaleing them down a bit at a later date. Update: I’ve run all the videos first throught te commandline ffmpg to downsize them to 360×240 and then ffmpeg2theora to create ogg versions. The supercuts get the parts of the video where a character is mentions, sometimes this is never when they are on screen. I had to use other parts of the movie to get posters for some characters. The supercuts let you focus on the character from other characters points of view and the POV of the writers and directors. Some characters I love and feel are important are not refered to much by name, the video file sizes gives a view of this, Ellis Carver’s video is tiny (I love how his character in season 1 hints of his growth during the wire as a whole). Although I’ve now watched most of season 1 (third time round) I’ve struggled to watch with a critical eye, or even an eye to a gif, the programme is too absorbing and emotionally involving. It has reinforced the series as my favourite tv. I am especially noticing the parts when charcters show complexity beyond normal tv. Kima, presented very positivly, leads the charge to kick and beat a youth that hits the rather usless police Pogue (or Mahone). The emotion showed by the character at the end of episode 10 and the beginning of 11 is viceral, rewatching brings back the shock from the first viewing in a suprisingly powerful way. Watching the supercuts allows you to step back a bit, pulls information about a character together in a suprising way letting you see the character and how their story is told in new light.